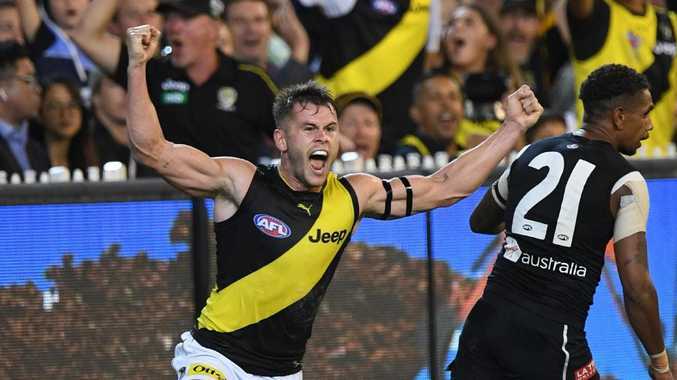 At least six men were involved in a wild punch-up after Thursday night's season-opening game between Richmond and Carlton at the MCG. 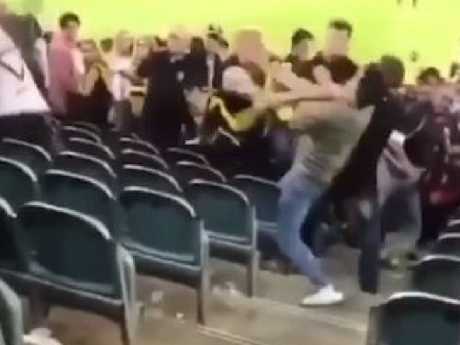 In disappointing scenes for the AFL, a brawl broke out on the ground level of the Great Southern Stand after the Tigers posted a 33-point win. 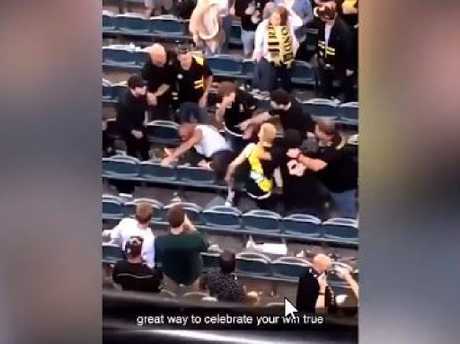 Video of the fighting showed one man, who was wearing a Richmond jumper, knocking out another man with a huge right handed punch before following up with three more blows to his fallen foe. Other vision uploaded to social media (which you can view in the video player above), which was filmed from the grandstand overlooking the action, showed a policeman making a belated arrival to the scene. Digusting scenes broke out at the game. 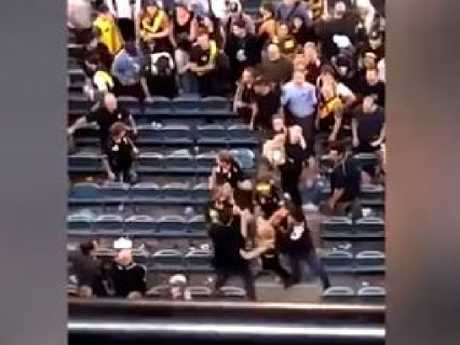 The fan in the Richmond jumper kept hitting another man when he was on the ground. Victoria Police told the Herald Sun a 19-year-old man was arrested. "It is alleged a fight broke out between a number of males inside the stadium just before 10.30pm," police said. "An Eltham man received an infringement notice in regards to riotous behaviour $322. The victims did not wish to proceed with further police action." AFL.com.au is reporting another incident occurred outside the Olympic Stand after the match that required intervention while popular Facebook page Nuffies on AFL Pages captured the mood of one fan before the game. Addressing the ugly clash on 3AW radio this morning, AFL CEO Gillon McLachlan said the league would consider banning those involved. "Every person that comes to our game needs to feel safe. That behaviour is clearly unacceptable and there needs to be an accountability for the individual or individuals involved for their behaviour and process that," McLachlan said. A witness told McLachlan her teenage daughter was sitting just a few rows behind where the violence broke out and was scarred by the shocking scenes. 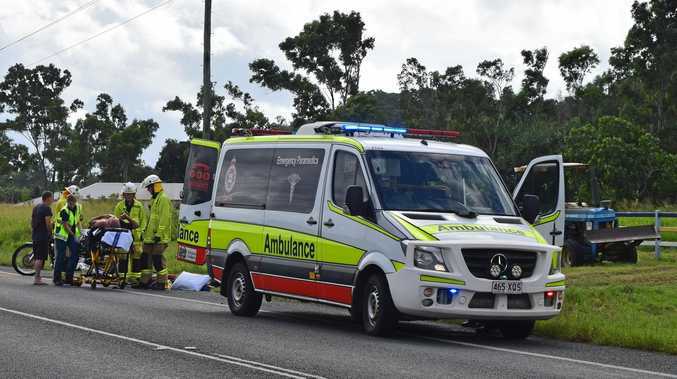 "She is traumatised," she said after calling in to the radio station. "She just came home and she said, 'I was so scared'. This is not good enough." 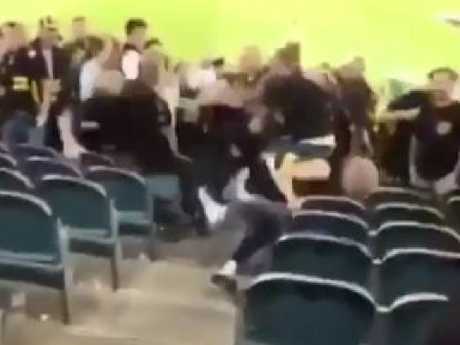 The incidents follow a number of violent clashes during the 2018 season, including one after a Geelong-Melbourne game that had the managers of the Cats' home ground discuss segregating fans. "We've been really lucky in AFL football that we haven't had to do that (and) we'd prefer not to do that," Kardinia Park Stadium Trust chief executive Michael Brown said. "Kardinia Park is the people's ground, it's a ground of the community. However, if the behaviour continues to be not of an appropriate standard, all those measures need to be considered by the trust." Too many instances of violent have broken out at AFL games recently. The mayhem continued after the final siren.